Nine elders from Temeke Lutheran Church in Tanzania visited Hancock in September. They spent time on Finlandia’s campus with René Johnson (left, front) from the university and sat in on classes. 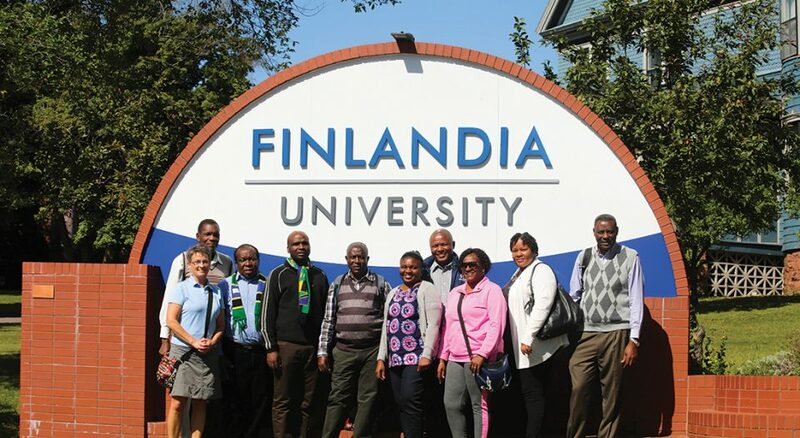 On Sept. 5, nine elders of Temeke Lutheran Church in Tanzania arrived in Hancock, Mich., to spend 16 days with hosts Finlandia University and Gloria Dei Lutheran Church. The university and the two churches have built a partnership that transcends more than 8,000 miles. Gloria Dei’s aim was to introduce the Temeke elders to the community. “We wanted them to see who we are and what life is like in Hancock,” said its pastor, D.J. Rasner. “It is like a visit between brothers and sisters,” said Euniace Bandio of Temeke. Bandio, who also visited in 2009, said this was the largest group to visit Michigan, and he was excited for his colleagues to see what was there. The visit included touring a copper mine; shopping; free time with host families; worship at Gloria Dei; touring a dynamite plant; preparing a Tanzanian meal; several day trips; a visit with Katherine Finegan, bishop of the Northern Great Lakes Synod; and a tour of Finlandia, including sitting in on classes. In 1994, the two churches signed a companionship agreement to walk together in faith. Gloria Dei sponsors a scholarship for a Tanzanian student to attend Finlandia; has hosted and funded visits from a few Temeke members; and some Gloria Dei pastors and members have traveled to Tanzania. In partnership, the churches exchange ideas, information and programs. “We are like worker bees,” Bandio said. Companionship blossomed when René Johnson was hired as Finlandia’s servant leadership director and assistant professor of religion and philosophy. Johnson and her husband, Philip, who is the president of Finlandia, served 14 years as ELCA missionaries in Africa, so she began immersing students in Tanzanian life through travel and projects. In 2005, she took 12 students to Tanzania. The trip has now become an annual experience and each time includes five or six Finlandia students and two or three faculty members. In 13 years, 83 students and 12 faculty have traveled to Tanzania. “You don’t have to be Lutheran; you don’t even have to be Christian,” Johnson said. The three-week trip connects the institution to its Lutheran heritage. “It’s the Lutheran intellectual tradition of going beyond your comfort zone, and sometimes you have to leave home to do it,” she added. During their visits, the Finlandia contingent provides creative learning curriculum at Kisarawe Lutheran Jr. Seminary (secondary school), and nursing students spend time shadowing nurses at the Muhimbili National Hospital in Dar es Salaam. Students and faculty who have made the trip unanimously agree it is a life-changing experience. Denise Vandeville, dean of the international school of art and design at Finlandia, said the 2013 Tanzanian trip was an opportunity that shook her to the core. She promotes the trip and connects her experience to the university through student fundraising for an art club she started in the Tanzanian high school. Bridget Durocher, Finlandia assistant athletic director, said she brought back an open mind and open heart. The trip taught her to be friendly to tourists and to slow down, relax and enjoy the day. Compassion, empathy and resourcefulness clicked for Brianne Maggio, a nursing student, during her visit to the hospital. “I was reminded about how privileged I am being from the United States. It wasn’t until I got home that I realized how privileged I am, not because [of] where I am from, but because of the experience I got to have in Tanzania,” she said. Student Tyler Borkadi was also impacted by the trip. “It really opened my eyes, mind and heart. You get a true understanding of what life is about and how you should value it,” he said.